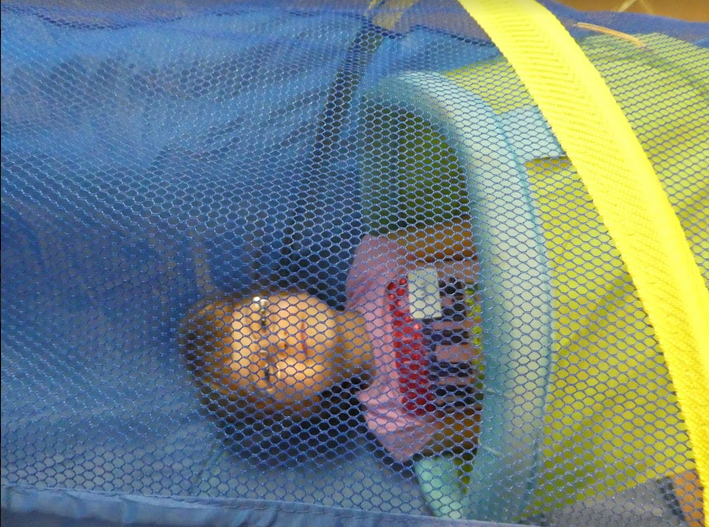 The Journey of Water - at Vogtsrain Kindergarten! It’s been a while! In the meantime, we were invited to create another amazing project in a kindergarten class in the Primary School of Vogtsrain in Zurich. 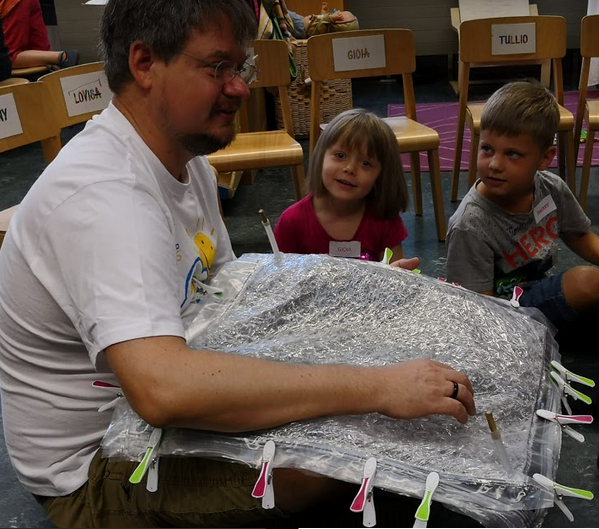 Together with Mareike Hug, their teacher, we organised a parcours for the 21 children to let them explore the wonders of water. 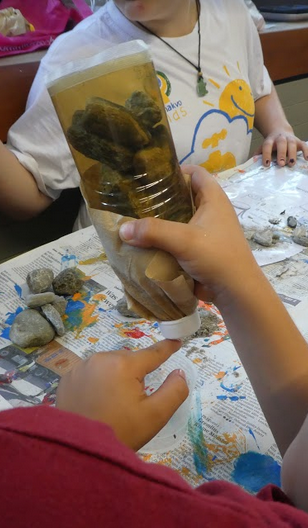 The first challenge was to clean dirty water by building their own water filter with a PET-bottle, coffee filter, sand and stones. In a second step they learned about the Sanakvo technology from Jan Marc Lehky (who is in the foundation’s council - find it here). They solved a puzzle and put the newest model of the module together. It was a lot of fun to hear about the lonely glycerine people who love water so much! 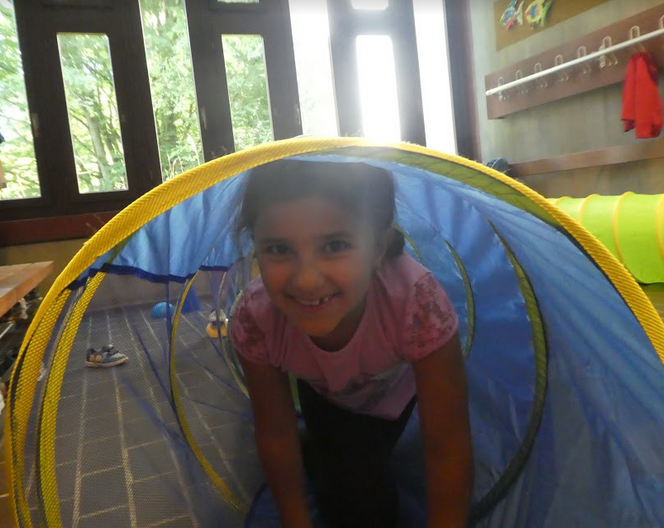 The next mission lead along journey of water through pipes and tunnels: The kids themselves went through an adventurous journey through toy tunnels and tricky slaloms. Last but not least, each kid was able to draw their own bookmark, which they could keep as a remembrance of the lovely time we had together. After the break, we moved outside. We were quite lucky with the weather and in the sunshine, we had set up a water-transport-race. The challenge was to transport water from one bucket to theirs with a sponge, until their bucket was full. The second half of the class was playing a water cycle jumping game, which they decorated themselves. After this fun discovery tour we were both excited and exhausted - as were the kids. They listened interestedly and participated with incredible energy, which made the certificate for completing the mission at the end of the morning well-deserved and all the more rewarding! It was an insightful and amazing morning which we enjoyed very much :) Thanks to Mareike Hug, who invited us, to Jan Marc Lehky and Aileen Salas from the Sanakvo Foundation who were there to support us, and of course to the cool kids! 'Sanakvo Kids' – children and youngsters spontaneously started to promote the new water-from-air technology! We are very pleased to see that a group of kids and teenagers have spontaneously started to promote the idea of water-from-air technology. They wish to help and inform colleagues and adults about a new Sanakvo water activity and would like to help needy kids in countries, where the poverty leads to the death of millions - after drinking dirty water. Young teenagers have started the Sanakvo-Kids blog http://sanakvokids.weebly.com/ full of information about their enthusiastic project. These youngsters, who live merely a first dozen of years on this planet, create original bookmarks and propose them to friends and adults to collect money for providing pure water to kids who were born in the poorest families in the world. It is very touching to see the new generation to be able of such a compassion! 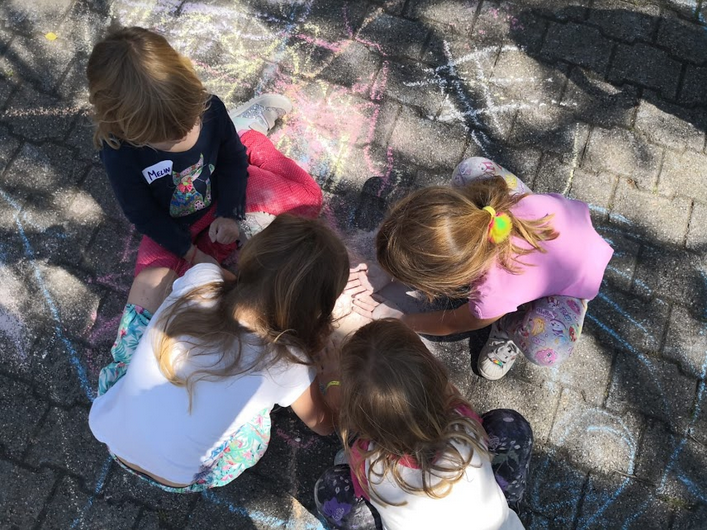 Now the Sanakvo-Kids action has spread to one Zürich school where on 4th of July, three classes of kids will join this movement. It seems that this highly humanitarian activity is spreading fast. Join the movement! Support the children project by a donation. Even a small contribution can make a difference! 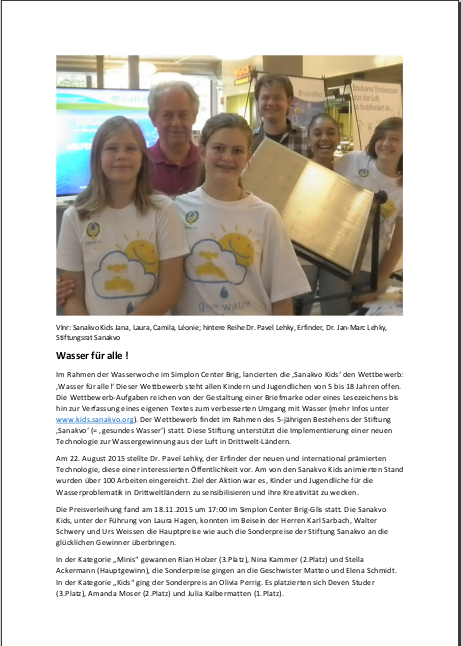 During summer 2014 the Sanakvo Kids have created and performed the song and video “Wasser für alle – Water for all” to draw the attention to the water scarcity in the world and their activities and commitment in helping to inform about the new technology of extraction of clean water from air. It is important to us, already at an early stage, to stimulate in children and adolescents an awareness of aid projects and dealing with the complexities of Third World aid. This is achieved by encouraging children and young people to develop themselves projects that can be used sustainably. In this sense, the Sanakvo-Kids organized in the summer 2015 virtually on their own and in cooperation with Migros Valais and the Simplon Shopping Center in Glis, a contest of ideas on the topic “water for all” for the 5-year anniversary of the Sanakvo Foundation. The prizes were donated by the Mattmark hydroelectric power plant (guided tour of the power plant), bookbinding Schwery in Brig (hand-bound book), Simplon Center Brig-Glis (shopping vouchers) and the Sanakvo Foundation (books on water). At this point, we would like to thank again the sponsors, the participants and the organizing children and adolescents. 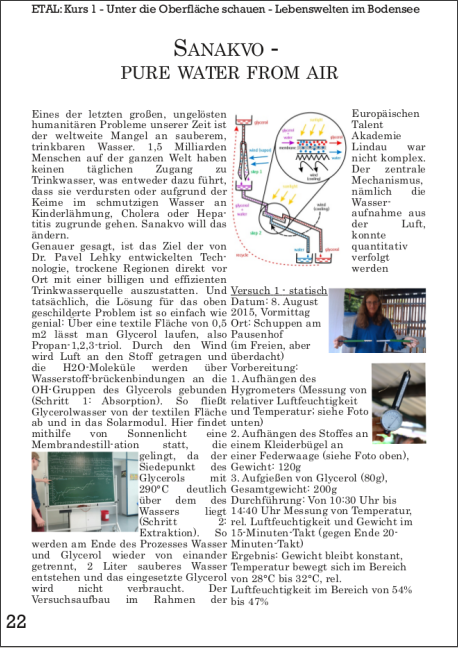 Also in summer 2015, during the workshop of the European Talent Academy in Lindau (Germany), young students have studied and analyzed the new water from air technology. Practical experiments were realized to measure the absorption of the air humidity by glycerol over time as well as the extraction of the absorbed water from the glycerol through distillation.